I’m a huge fan of sweet potatoes. Not yams! But sweet potatoes. Baked until they’re soft, with a sprinkle of brown sugar and topped with marshmallows an toasted pecans. 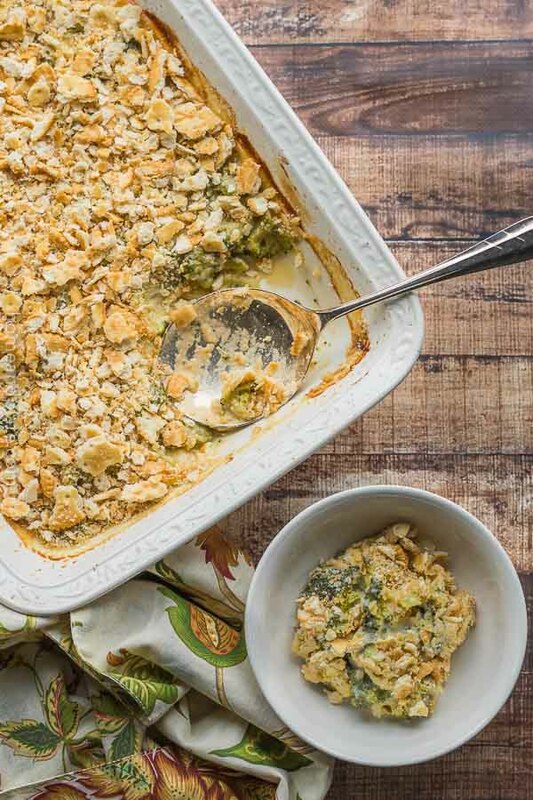 I don’t know about you but my favorite dish at Thanksgiving is a sweet potato casserole. Do you love sweet potato fries? I’m a huge fan. 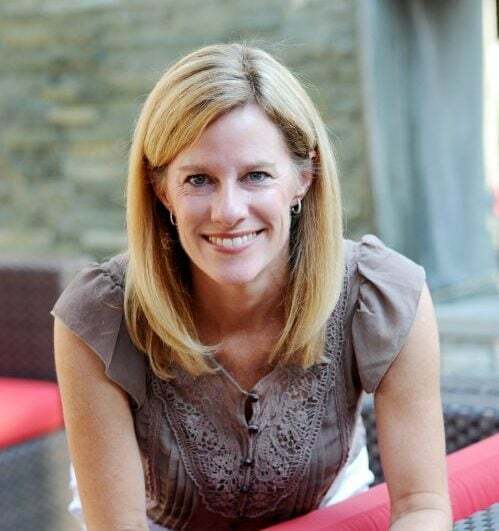 I also love crispy sweet potato chips with a sprinkle of barbecue seasoning. There’s nothing better on game day! And they’re so simple to make with three ingredients. They’re baked, so they’re healthy. No guilt! Kids love them too. It’s easy to simply substitute sea salt in place of the barbecue seasoning for younger palates. There are a few tips to follow to make sure you end up with golden brown chips instead of ones that are burnt. Slow and low is key when baking these chips. 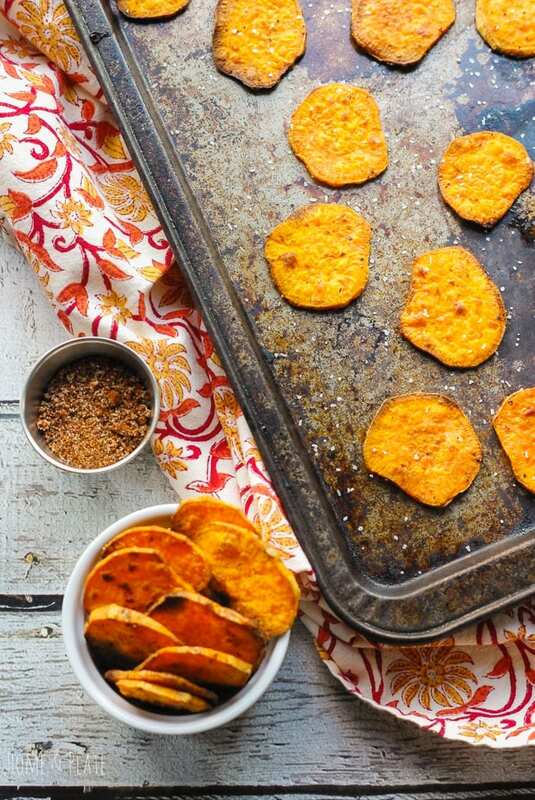 Use a knife, vegetable peeler or mandolin to slice the thinnest chips you can. I’ve tried baking these chips for 30 minutes at 400° and unless you’re watching your oven closely you will end up with burned chips. You’ll want to layer them in a single row and flip and rotate halfway through the baking cycle. Once they are golden brown, they are ready to come out of the oven. 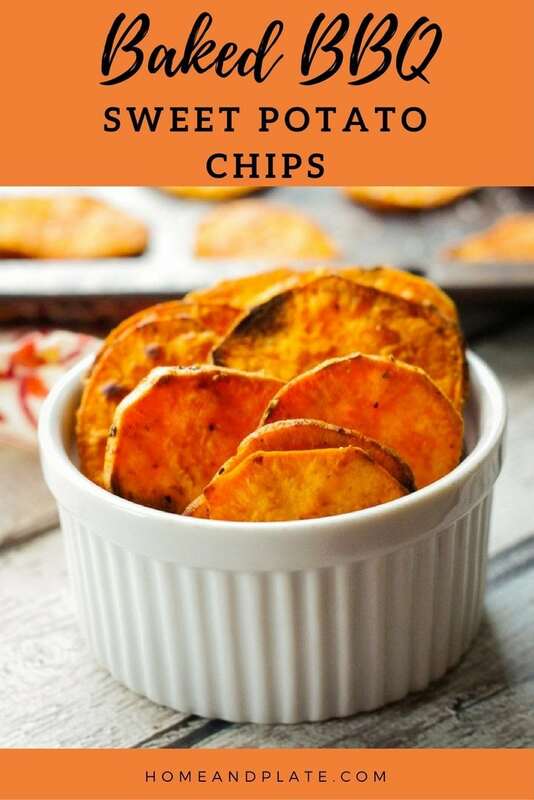 Enjoy them as is or make your favorite sweet potato nachos using your chips as the base. 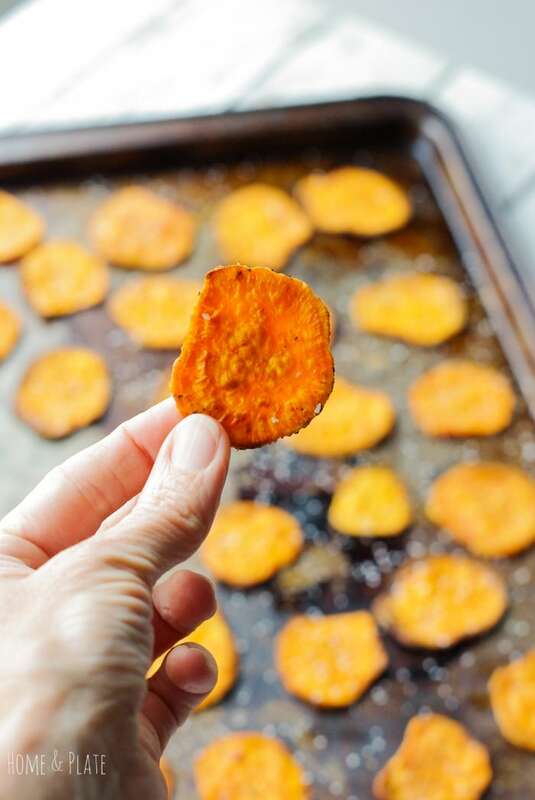 WANT TO TRY THESE BAKED BBQ SWEET POTATO CHIPS? 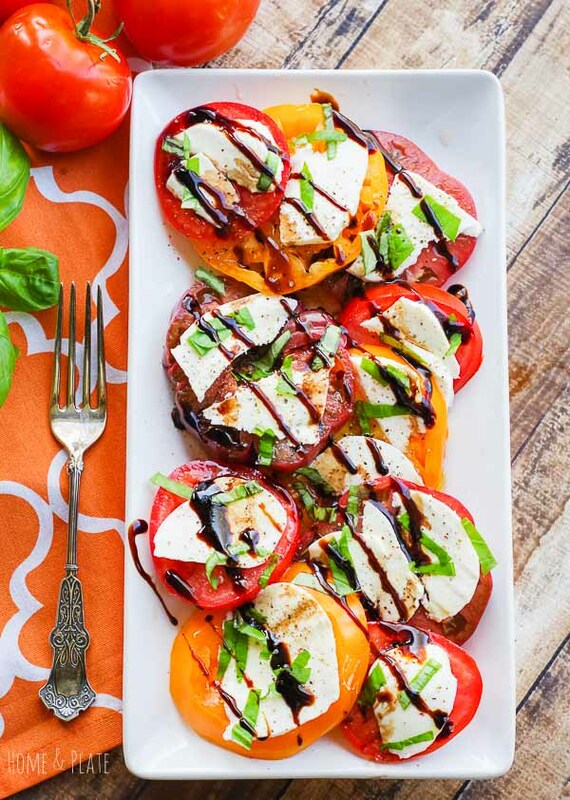 PIN THEM TO YOUR GAME DAY OR VEGGIE BOARD TO SAVE FOR LATER! 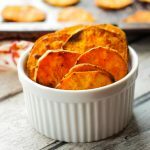 Sweet and spicy, these sweet potato chips are tossed in a barbecue seasoning and baked to perfection. Position the oven racks to the center of the oven and then preheat the oven to 275°F. Slice the peeled sweet potatoes thinly and uniformly using a knife, mandolin or vegetable peeler. Toss the chips with olive oil and barbecue seasoning until well coated. 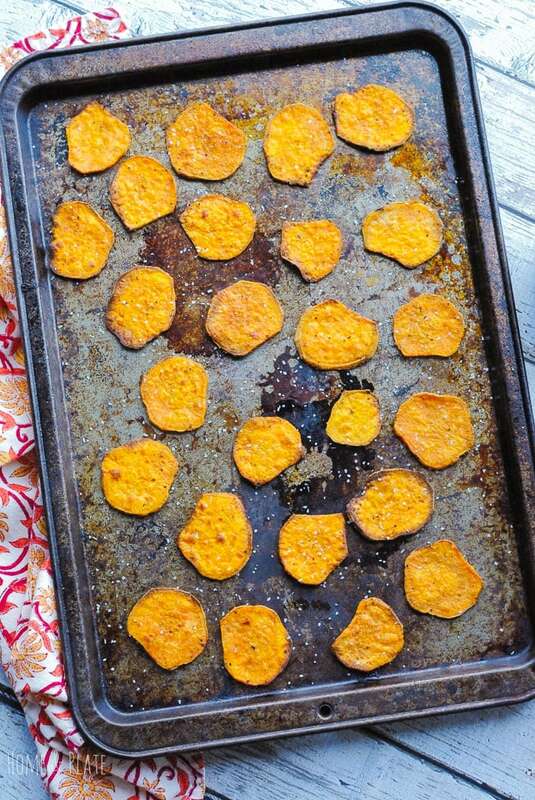 Arrange the sweet potato chips in a single layer on a baking sheets and bake for about 1.5 hours. Bake the chips, flipping halfway through, until they are evenly cooked. When they are crispy brown, remove them from the oven and allow them to cool before serving. OMG this looks so crunchy and perfectly sweet!! I ‘m in LOVE! 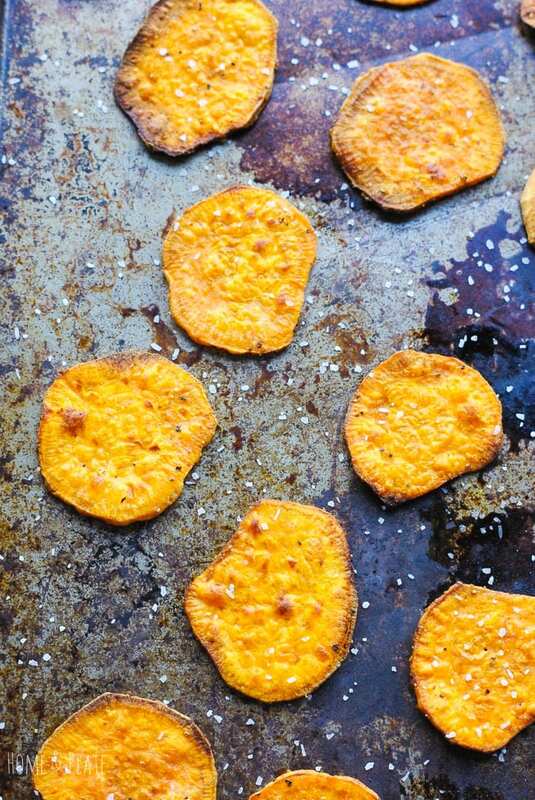 These chips look like the perfect crunchy snack, packed full of flavour! Oh my those look good. Why have I never thought of making these? Shared! They are too easy to make and delicious too. Thanks so much.